The CarbonPro bed will go into production in “early June,”according to GMC. 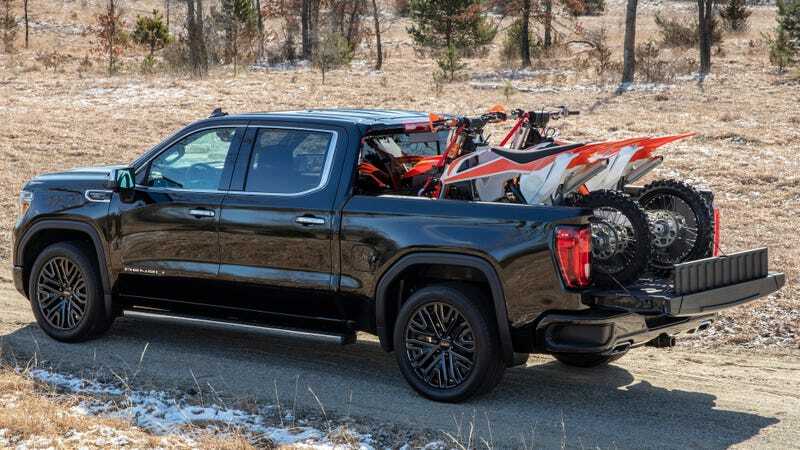 It will only be available on Denali 1500 and AT4 1500 models at just a small number of dealerships initially, with a broader roll out continuing into next year. Pricing still hasn’t been announced, so we’ll have to wait and see if it’s even worth it. GMC claims the new carbon bed is better than the traditional steel because it’s naturally corrosion resistant and 25 percent lighter, saving about 60 pounds in this case, with more functionality including additional tie-down points and specially designed indentations, and of course, extra strength and more durability. It also apparently increases overall cargo volume in the bed area by one cubic foot. As part of its durability testing, GMC claims it pointed the exhaust from a portable generator at the bed, drove a snowmobile with metal studs out of the bad at full speed, and dropped cinder blocks, 450-pound steel drums of water, and 1,800 pounds of gravel on the material. Part of the supposed benefit of a carbon bed is also that you no longer need to get a spray-in bedliner, nor wheelhouse liners, as the material is supposedly dent resistant enough. GMC claims it’s the “most scratch, dent and corrosion-resistant pickup bed in the industry,” and it joins the new MultiPro six-way folding tailgate up the company’s sleeve of pickup tricks. Now it just needs a gold foil-lined exhaust.